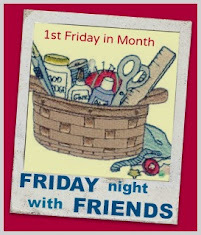 I always love Friday night…..getting to stitch with lots of my favourite people….and Friday was no exception. This sums it up perfectly…..
Well….maybe a good stitchery……and a good glass of wine!!! I got to finish the last of my stitcheries on this beauty…. It’s a commission for an upcoming edition of Patchwork and Stitching……so that’s my agenda for this afternoon….and seeing the sky is grey and overcast, I think it’s going to be just perfect sewing weather! Pop on over to Chez's blog to see what everyone else got up to on Friday night….you might even get some inspiration……it pops up everywhere!!!!! Your stitchery project is beautiful. Very cute cornerstones. Great nights effort. Just gorgeous stitching my friend. It's looking beautiful. The corner stones are very cute. the quilt is coming together beautifully.